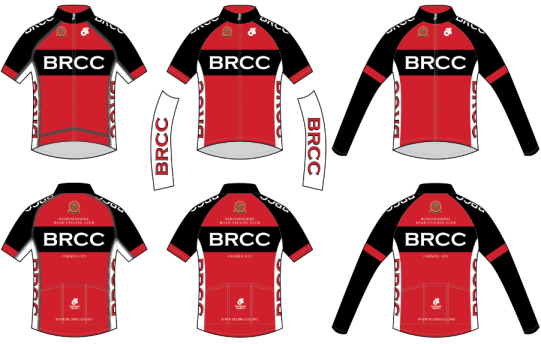 A Cycling Club with something for Everyone! Welcome to Beds Road CC - a cycling club run by its members, for its members, from our club-house in Cardington. The first time trials of the 2019 season have now been run and will continue until October. Our Sunday morning and Thursday evening club TTs provide a friendly format, on quiet roads, ideal for anyone new to time trialling and for experienced competitors alike. Well Done! We won the Inter-Club Competition 2018! Results just in on 1 October 2018 that we have come top in the Inter-Club time Trials competition! Well done to everyone who took part, especially our Lady riders who made the decisive difference! Let&apos;s do it again next year! We offer something for everyone, from leisurely rides to top level competition. From 6 to 96, if you like to ride a bike and want to develop your enjoyment and skills, why not join us? New to cycling? Joining Beds Road CC is a way to meet like-minded people, add some structure to your riding, and get guidance from experienced riders. 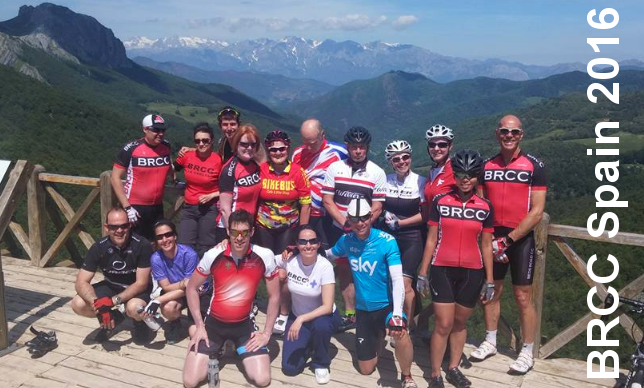 As a starting point, why not try our Sunday social rides? We have rides for all abilities with varying distances. Other rides are organised by members during the week – check our FB page for details - see FB link at bottom of page. Want to get fitter and stronger? During the winter we run turbo sessions on a Thursday night from the clubhouse in Cardington, check our facebook page for details, link at bottom of page. From April, test yourself in a time trial by joining the Evening-League on Thursdays, or our popular SPOCO series on Sunday mornings, all of which are open to all abilities, with tea, cake, and sympathy in the clubhouse afterwards. You never know, you may enjoy this form of challenge so much you want to specialise in Time Trials. We also hold a number of social events during the year, as well as events that form part of our annual interclub competition – a way to link with other local clubs in friendly rivalry. Check Facebook and our calendar for details. For our younger riders, aged 6 to 16, we hold British Cycling approved Go-Ride sessions at Priory Park on Saturdays, which introduce riders to bike handling and the thrill of competition in a safe, off-road environment. If you want to find out more about the many things we do, why not pop along to the club when we have an event on the go, or check our Fabebook page (link at bottom of this page) , post a question on the forum, or send a message direct to one of our committee members, who will be delighted to help you. 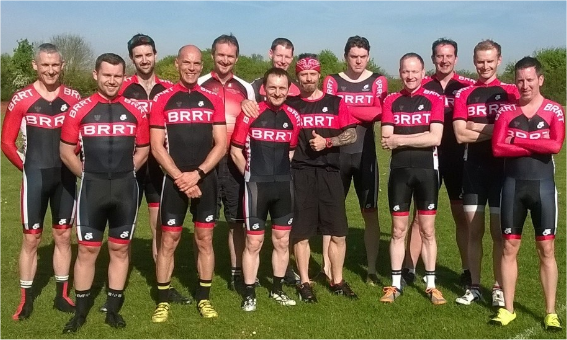 Once you have some experience, you may want to aim for a place in our racing teams under the BRRT banner (Beds Road Racing Team). Riders showing promise will be invited to become a team member, provided places are available. Team members have their own kit to differentiate them from the standard club riders, and take part in more structured training sessions to fine tune their potential. L-R: Kieron Lewis, Daniel Sibley, Matt Donovan, David Cook, Mick Case, Jon Friend, Peter Gell, Simon Norman (Cap. ), Patrick Smith, Mark Wenham, Mark Gray, Matthew Cook, Paul French. Thanks to Andy Smith for the photo! 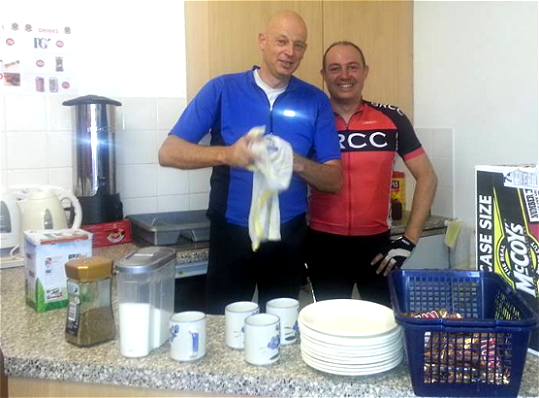 Most of our time-trial events start and finish outside our club-house - pop in afterwards for a tea, coffee, cake etc - service with a smile! The club has an active social side too, with social rides, BBQ's, quiz nights and an annual awards ceremony to celebrate peoples' successes during the year.